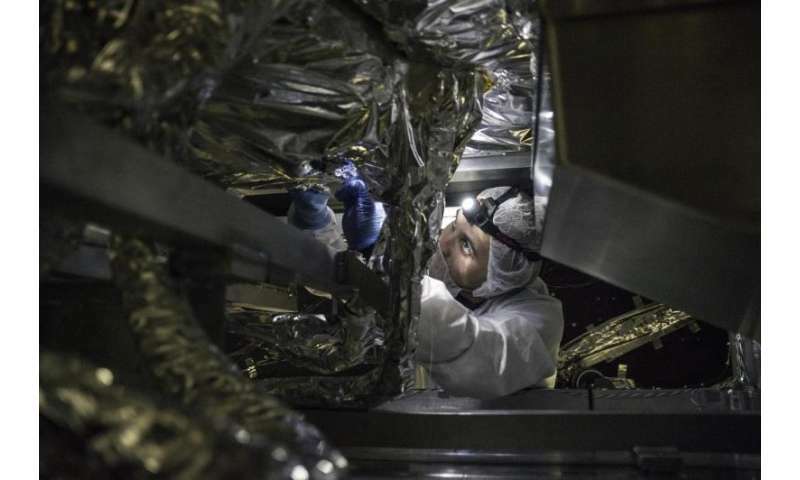 Crouching low beneath the underbelly of the behemoth James Webb Space Telescope "observatory core" test model, surrounded by critical test hardware, a technician toiled for hours wrapping the replica's surfaces in delicate thermal blankets and strips of Mylar. 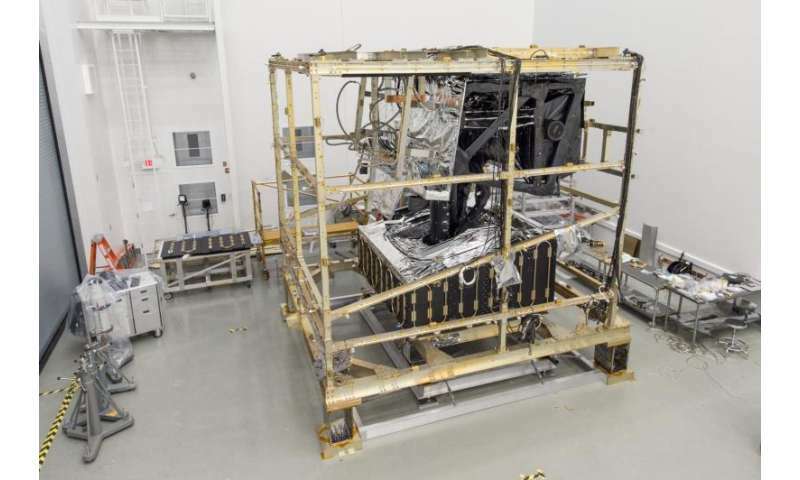 The observatory core model will stand in for the real thing in an upcoming test at NASA's Goddard Space Flight Center in Greenbelt, Maryland. Dubbed Core-2, the test will verify that Webb can regulate its core body temperature to the correct specifications, which would be impossible without the blankets created and applied by Goddard technician Andrew Peterson and his team. 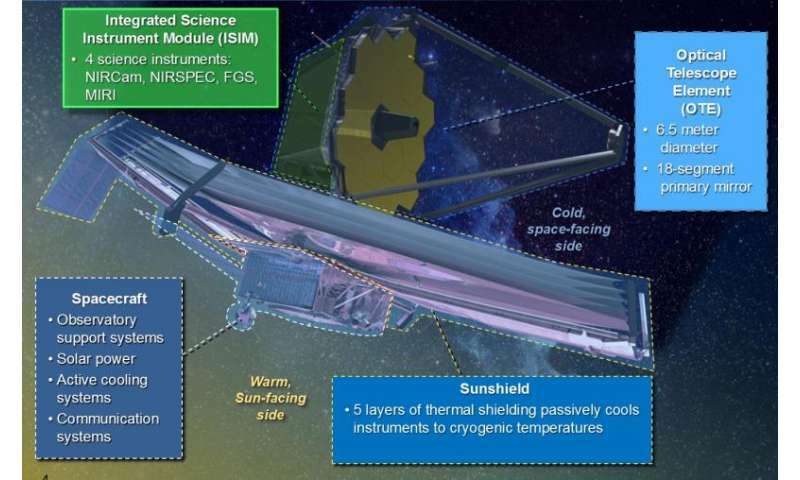 Webb is an infrared telescope, which means errant heat from the sun, or even a tiny bit from the observatory's own electronics, could blind it as it peers into the darkness, looking for the most distant galaxies in the universe. The team must test the observatory in its fully deployed configuration. After launch, Webb will unfold and expand over the course of two weeks. Cooling down to stable operating temperature will take much longer, and most of the heat flow through the observatory happens in its core region—a sort of Grand Central Station for heat flow on Webb. Webb is so enormous that it won't all fit in NASA's testing chambers. Webb will have to fold up even to fit in the rocket that will take it to space. Fully deployed, Webb will be as wide and as long as a tennis court and about 4 stories tall. The telescope would be almost 20 feet too wide to fit in Goddard's thermal vacuum chamber, the Space Environment Simulator. Even the famous Chamber A at NASA's Johnson Space Center in Houston is too small. Moreover, even with a chamber big enough to hold Webb fully-deployed, it is infeasible to recreate the entire temperature environment it will see when operating with a difference of about 500 degrees Fahrenheit between its 'hot' and 'cold' sides. The solution? An identical twin of just Webb's core, which contains the juncture between all four of Webb's modules – the spacecraft bus, sunshield, mirrors and instrument module. As many as 15 technicians at a time labored on the model, working to make it as identical to the actual telescope as possible. 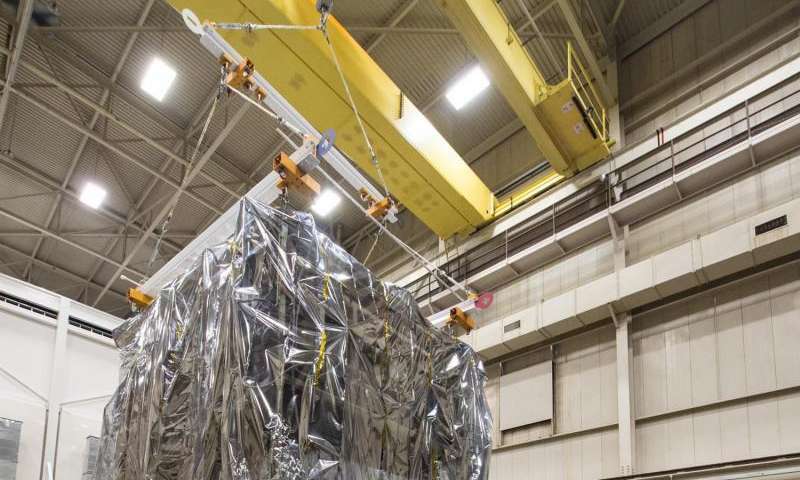 "I've been here 10 years, and I think this is the biggest thermal test we've ever had," said Chris Matthews, Goddard mechanical integration technician. His team put the model together and transported it to the test chamber. Building the core in its deployed form made what would already have been a complicated process even more challenging. It was important that they follow the same procedures as they would for the actual observatory – this was their dress rehearsal, and they had to make sure the core test model accurately reflects how the real thing will behave in space. The extra effort to build a full-scale, flight-like model is worth it because it's the only way to test Webb's core region and measure heat flow through it, and managing heat flow and controlling temperature is one of Webb's biggest requirements. In flight, nearby heat sources – like instrument module control electronics emitting around 200 watts only a few feet away – could blind Webb's sensitive infrared sensors, which are designed to observe distant objects in the universe by detecting their heat output. A stargazing astronomer in New York City will not see many stars – the bright surrounding lights will drown out their faint glow. The concept is much the same with Webb and heat. Proper management of heat flow is key: Every bit of unwanted heat passing the wrong way through Webb's core and ending up where it shouldn't would make the telescope's job that much harder, if not impossible. More than 500 tiny sensors affixed to the replica will monitor each piece's temperature during the test. There isn't much room for error. Goddard thermal engineer Paul Cleveland said the mirrors can't operate as intended if more than 15 milliwatts of extra heat energy reach them. By comparison, a 100-watt light bulb uses 100,000 milliwatts when it is turned on. During the test, Cleveland and his team will expose the test model to 48 days' worth of temperature extremes, dipping as low as minus 423 F. How the twin core reacts will tell the Webb team what they can expect from the real thing. "This is the only time we're really testing the thermal center of Webb," Cleveland said. "This is our chance to make sure we got it right." Cleveland and the team will find out soon: the Core-2 test started mid-April. With Webb's twin finished, the same team will turn their sights to constructing the actual flight hardware in the next several months.